In September 2015, we invite youths from the Bergen area in Norway to join a workshop in which they can learn various storytelling techniques. 10 youths are invited to bring their own stories - stories from their own lives - to the workshop. 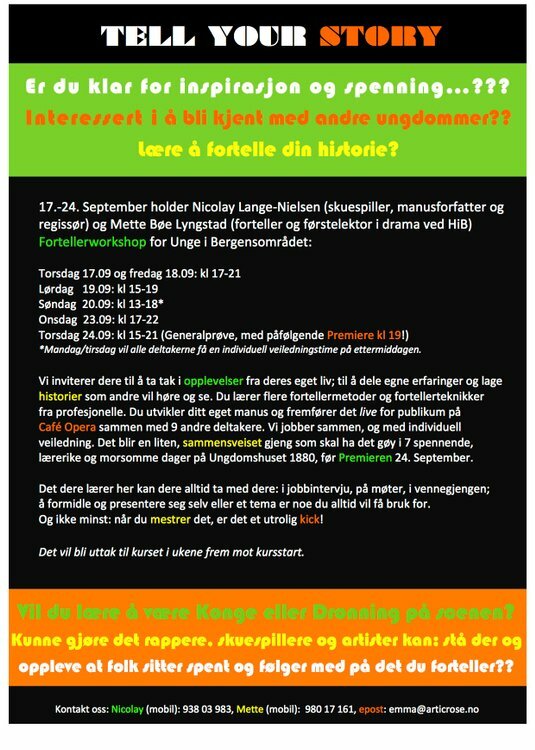 Through professional tutoring by Nicolay Lange-Nielsen and Mette Bøe Lyngstad, the participants will work towards a staging of their very own stories - live in front of an audience at Café Opera in Bergen on September 24th! or email Emma at: emma (at) articrose.no. The workshop starts September 17th at Ungdomshuset 1880 in Bergen!